Home T20 Cricket "Getting Your Eye In" - How long does it take? There has been various discussions over the years as to the importance of wickets in T20 cricket. Way back in 2008, an article on Cricinfo stated that "wickets don't mean much in T20. This fact doesn't seem to be widely recognised, but the whole concept of the 20-over game relies on it. If wickets were important, then batsmen wouldn't blaze away at 8 or 9 an over." Manish Verma wrote in an article in 2014 on the Red Bull website that "it is wickets that are best at slowing down the scoring rate, even in the shortest form of the game." An article by Tim Wigmore last year spoke about Leicestershire approach to bowling early in the game, explaining how "with the ball, Leicestershire attacked early on, even if it meant leaking boundaries, recognising that ultimately the best way to contain a T20 innings was to take regular wickets." Tim also wrote later in the year about the West Indies approach to batting, explaining that "wickets have been systematically overvalued in T20, holding totals back." It is interesting how the discussion has gone from feeling that wickets are relatively unimportant in T20 to how they are the best way to limit the run-rate, whilst also recognising that their impact on restraining the run-rate is itself only based on flawed strategy from the batting teams. Wickets may only be important in containing T20 innings because teams think that wickets are important in containing their innings. If teams moved toward a mindset, as the West Indies have done for periods, that wickets are less important and having hitters down throughout the order means that you can sacrifice wickets with little slowdown in scoring, then wickets may well become relatively unimportant. There are obviously caveats to that. It is important to remember that, regardless of how a player coming in to replaced a dismissed batsman approaches his innings, if that player is substantially less able than the batsman that he is replacing, that is a blow. For example, if Andile Phehlukwayo comes in to replace AB de Villiers, that wicket is important. Regardless of the importance of wickets themselves, the topic that I wanted to look at for this article is how long it takes a new batsman to 'get his eye in' following a wicket. 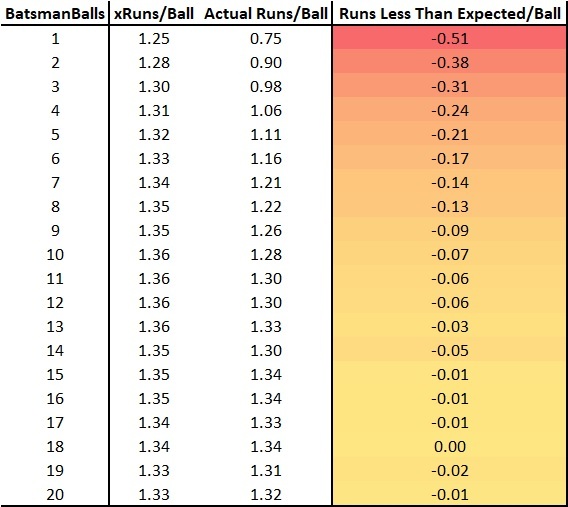 For each ball in a T20 innings, I currently generate an 'expected runs' value that indicates what one would expect the average batsman to score off that ball. This is calculated by looking at the average runs that particularly ball at that stage of the innings, then adjusting that based on the ground and the bowler. For example, in the 2017 T20 Blast match between Durham and Nottinghamshire at Trent Bridge, the final ball of the powerplay with Durham batting was bowled by Jake Ball to Michael Richardson and was given an expected value of 1.50 runs. The final ball of the powerplay with Nottinghamshire batting was bowled by Ryan Pringle to Alex Hales, a far superior batsman, and this was given an expected value of 1.61 runs. 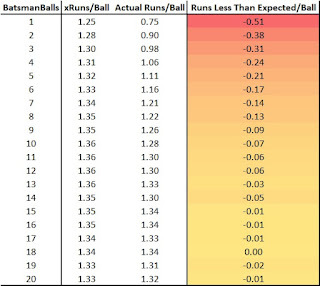 Using these expected runs values, we can look at how batsmen perform compared to expected runs when having faced certain numbers of balls. For example, across my entire database, batsmen facing their first ball would be expected to score 1.25 runs, but in actuality, they only score 0.75 runs. From this, we can see that they score 0.5 runs less than what we would expect. The table shows the values for the first 20 balls of a batsman's innings. We can see that averaged across the entire database, it takes roughly 15 balls faced for batsman to reach the average scoring rate (in this case, given it includes the entire database, this average would be 0.00). However, one might ask the valid question of whether elite or very good batsmen are likely to get scoring at a quicker rate? If we narrow the focus down to those batsmen with a rating of 1.10 or greater in my rating system, we do indeed find that it takes these batsmen quicker to reach the scoring of an average batsman - just 6 balls for this group of players. Similarly, for poorer batsmen with a rating of 0.9 or lower, it takes them roughly 24 balls to reach this scoring rate. Now this is not particularly surprising. What is interesting is that if we look at how quickly each group reaches the expected scoring rate for that specific group, rather than for the average player. For example, for the elite group, they have an overall expected scoring rate of 0.10 runs above average per ball faced, for the very good group, this is 0.05 and for the poor group, this is -0.15. In other words, the elite batsmen are worth 0.25 runs per ball more than the poor batsmen. However, whichever group we look at, we find that it takes 7 balls faced to reach the expected scoring rate for that group. We also find that for both the elite and very good groups of batsmen, the scoring rate levels out at between 0.05 and 0.1 runs above the expected rate for that group from around balls 10 to 30, then we find it tends to take off again around the 30 balls faced mark, which suggests this is the point when the batsmen feel properly settled and confident to launch their attack. For the poor batsmen, we again see the levelling out after around ball 10 at 0.05 to 0.1 runs above the expected rate for the group, but there is no sign of any acceleration again after that stage. Do batsmen consciously play more defensively during the first few balls faced? From this, we can see that it is not only the fact that they have a higher scoring rate during the middle parts of their innings that sets the top T20 batsmen apart from the rest. It is also the fact that they have an additional gear to step up into once they are settled that the lesser batsmen do not appear to have. However, it seems that it takes almost the exact same number of balls for all batsmen to 'get their eye' in and reach the rate that we would expect them to score. Returning to the initial discussion, what does this mean about the importance of wickets in T20s? Well, clearly it shows that dismissing an elite batsman and replacing him with a lesser quality batsman is important, but it did not really require any analysis to realise that. However, it does show that taking wickets is currently important to restrain the scoring due to this 'getting their eye in' period that all batsmen appear to perform. However, we cannot really tell from this whether this is a conscious action on the part of batsmen (i.e. 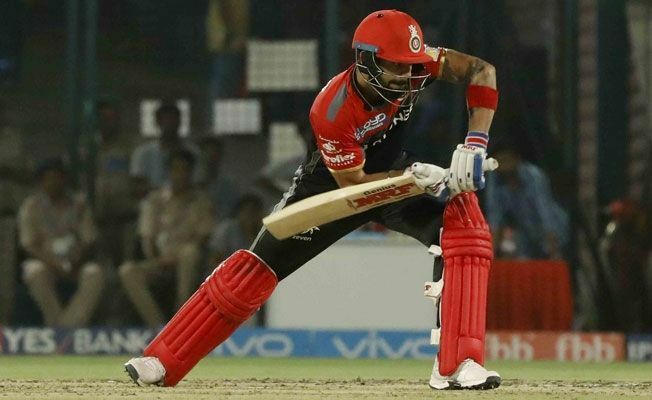 they are actively taking less risks at the start of their innings) or whether it simply does require time for a batsman to up his scoring rate and there is nothing that can be done. One way of looking deeper into this might be to look at whether we see more wickets than expected in these early balls of an innings. Logically, one might expect settled batsmen to be dismissed less than expected, while new batsmen might be dismissed more quickly. This is something that I will return to in a future article.